Hello Kitty cake birthday Cakes Long Island New York. 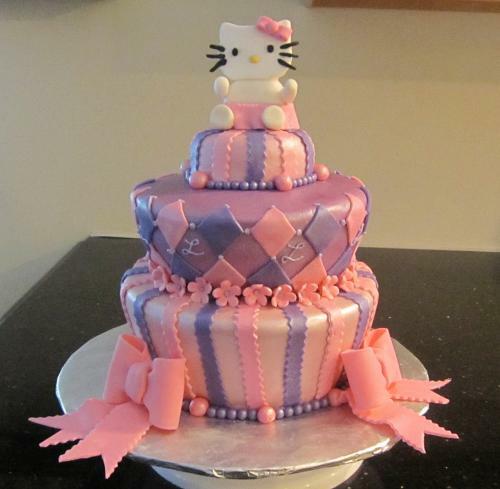 A whimsical Hello Kitty cake is the perfect gift for a girls birthday party. This particular cake is made with a custom designed edible cake topper. Comes complete with pink bows along the bottom tier which create the perfect Hello kitty cake accessories. The middle tier of this Hello Kitty cake design is filled with a sweet butter cream filling and wrapped in a delicious lavender colored fondant. We also incorporated a nice diamond pattern often seen on most cakes of this kind. The bottom tier is a chocolate flavored cake with a custom peanut butter flavored filling. The delicious combination of ingredients and colors was specifically requested by the young recipient of this lovely designed Hello Kitty Cake.